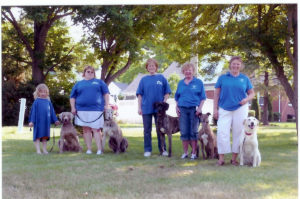 June 2007 – several club members volunteered to pose with their dogs for a Humane Society fundraising calendar. In 2006, the Richland County Kennel Club purchased a total of 42 sets of oxygen masks for canines/cats from SurgiVet in Wisconsin to donate to all fire departments in Ashland, Crawford and Richland counties. Two local news journals had coverage of the events. A photographer from the the Mansfield News Journal was present for the distribution of masks in Richland County and a photographer from the Ashland Gazette was present for the distribution of masks in Ashland County. The local TV station in Mansfield, WMFD, was present for the distribution of masks for Crawford County. The story actually appeared on the local TV station on 12/22/06. The Richland County Kennel Club also sponsored a public information booth at the Bellville Street Fair in Richland County and distributed 1000 frisbees on 9/13, 9/14/, 9/15/, 9/16/06.